Using units can be an important part of making sure your expressions are correct. You can use units routinely on Numerari because just one or two key taps can enter any of the major units. All expressions are checked for unit consistency. Keys for the major constants are also available that will insert a symbol representing the constant's value with its units. In general, the units for an expression are internally simplified and then an attempt is made to choose reasonable units for the answer. Note that for the special case of an expression that is a sum of terms, the units of the term farthest to the left are used as the units of the answer. Also, for the special case of an expression that is just a number with units, the units are returned unchanged. If the units shown for an answer are not what you want, you can always use the convert key to specify the answer units. This provides a lot of flexibility. 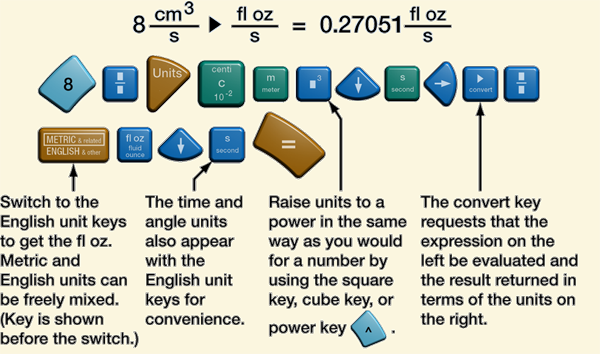 You can use the convert key to turn Numerari into a powerful unit conversion tool for arbitrary combinations of units. In another use of the convert key, you can request that the answer be shown with particular metric prefixes. The example above that returned its answer in newtons could be recast to return the answer in millinewtons. That example could also be changed to ask for the answer in the English unit of pound force. Using temperature units with the convert key to go from one temperature scale, say Celsius, to another, such as Fahrenheit, is straight forward. However, if you use temperature units inside an expression having other units, you must be careful. It is not possible for Numerari to distinguish between the specification of a temperature difference, like you would use when multiplying by a heat capacity, and the specification of an absolute temperature, like you would use in the ideal gas law. Thus, a temperature inside an expression cannot be converted automatically to an absolute temperature scale. When working in thermodynamics with an expression such as the ideal gas law, any conversion to an absolute temperature scale, such as kelvin, must be done in a separate calculation or with an embedded conversion. Below is an ideal gas law calculation with the degrees Celsius converted to kelvin using an embedded conversion. The arguments of trigonometric functions like sine are assumed to be angles. If no units are specified for an angle, the radian/degree mode key sets the angle's interpretation. Below, you see the same expression resulting in two different answers depending on the mode setting. When the mode is set to "RAD", the sine of 15 radians is calculated. When the mode is set to "DEG", the sine of 15 degrees is calculated. However, if an angle is assigned units, such as radians or degrees, then the angle is interpreted in that way regardless of the mode. Note that the radian/degree mode also determines whether radians or degrees are returned by the inverse trigonometric functions. Finally, if you need to see the value and units for a particular constant, you can just tap the constant key and then tap equals. The constant expression is evaluated to show you the constant's definition (you may have to adjust your number formatting settings to see all of the digits). If you prefer to work without units, you can remove the units from our constants in the settings.